£50 non refundable deposit, £75 security bond. Full cost to be paid minimum of 6 weeks prior to start of holiday. Only clean well behaved dogs allowed, either 2 small dogs or 1 larger dog only. Our brand new, April 2017, caravan is situated on Lake View which is a lovey quiet cul de sac opposite the boating lake.. 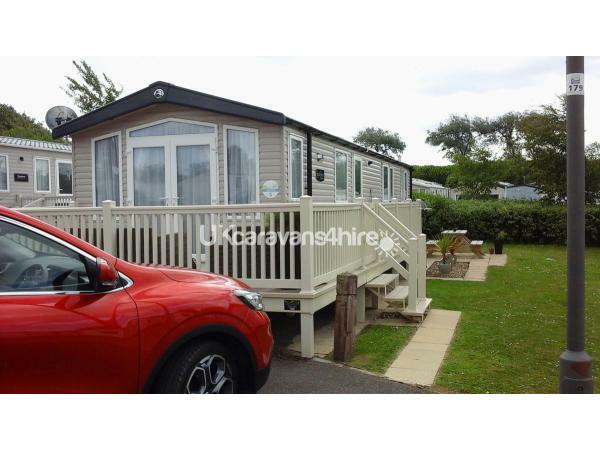 The caravan has everything you need for a relaxing holiday on this lively 5* holiday park on the North Yorkshire Coast. 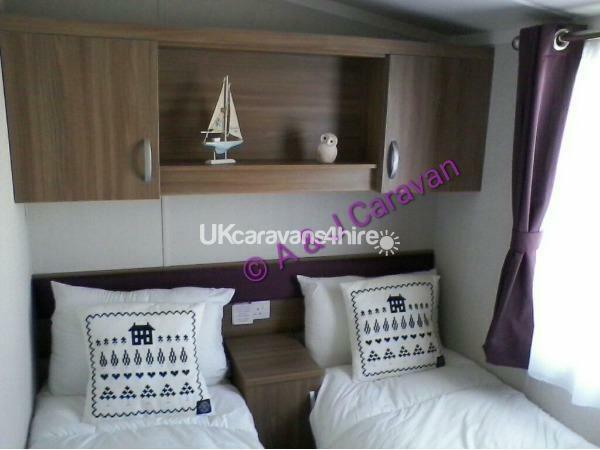 The caravan has 3 bedrooms, 1 double and 2 twin with en-suite in master bedroom. The shower room has a large walk in shower cubicle, a toilet, sink and storage cabinet. There is also a second toilet with sink so no queuing. The living area is open plan with French doors opening onto the wraparound veranda. In the lounge there is a 40" flatscreen TV, a DVD player with variety of DVDS for your use, 2 large comfy sofas, built in bluetooth surround sound, log effect electric fire, large coffee table with 2 pouffes. 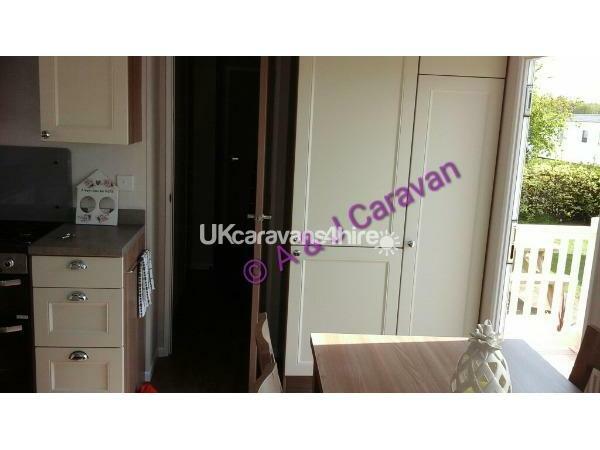 The modern kitchen has a large fridge freezer, a full size cooker with separate oven and grill, a microwave as well as usual pots/pans/cutlery/kettle/toaster. There is a freestanding dining table and chairs. All bedrooms have lovely thick comfortable mattresses, wardrobes & bedside cabinets and master has a dressing table. Outside is a parking bay for your sole use. 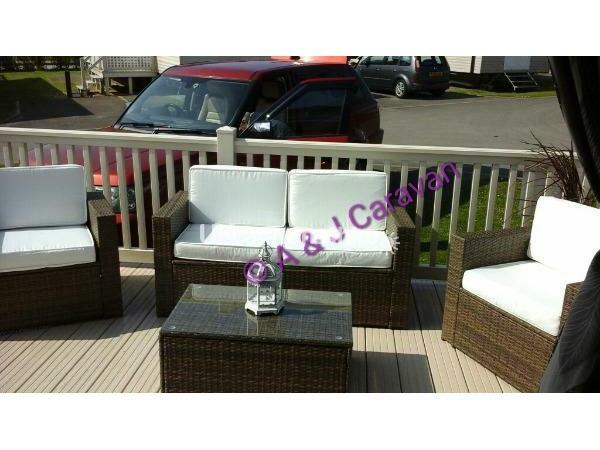 The large wraparound veranda is accessed from the parking bay by 3 steps and a lockable gate. 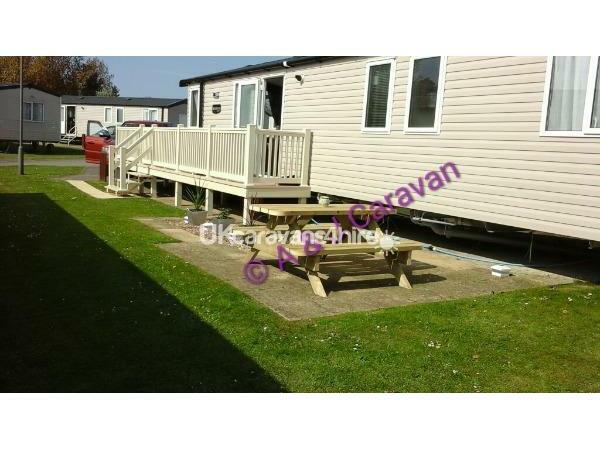 Next to veranda towards the rear of the caravan is a paved patio area with a picnic bench ideal for outside dining. There is also a rattan sofa set with comfy seat cushions on the front of the veranda for relaxing in the afternoon/evening sun. We supply all duvets, pillows, mattress & pillow protectors so all you need to bring is your own bed linen and towels. A section of DVDS, games and books are available for your use should you wish to use them. Pets: dogs are permitted subject to either 2 small dogs or 1 large dog. Dogs must not be left alone in the caravan nor should they be allowed on the furniture or in the bedrooms. Please note Haven do not permit certain breeds of dog. Haven rules apply whilst walking dogs on park. Check in time 1pm check out 10am. Keys will be available at the caravan so no need to queue to pick them up from reception which means your holiday can start as soon as you arrive. We ask that you leave our caravan as you found it and we will supply a vacuum cleaner and cleaning supplies to assist with this. Your security bond will be refunded once caravan has been checked and everything found to be in order. Facility passes are not included in the price but can be purchased from reception on arrival. All gas & electricity is included in price please ensure everything is turned off when you vacate the van for safety. New sky dish fitted just bring your own box & card. Additional Info: Primrose Valley is Havens 5* flagship all action holiday park with lots to do both on and off the park day& night. New for 2017 is The Lakehouse development including restaurant, takeaway, ice cream parlour. The boating lake, sporting activities, climbing wall, rope walk, segway hire, funfair, lazer quest and multi sports courts are all close by. There are 3 pools to choose from, two indoor pools with thrilling slides and water features, plus an outdoor pool with sun loungers for those lovely summer days. Close to popular tourist destinations Filey, Scarborough and Bridlington with Whitby and the North Yorkshire Moors a short drive away.There are lots of evening entertainment, from bars and restaurants to stage shows, pantomimes and live music.There’s so many places to find great food and drink at Primrose Valley. From mouth-watering meals at one of our bar and restaurants to traditional seaside fish and chips and takeaways you can enjoy in the comfort of your own holiday home. We’ve also got some of your favourite names on-site, so you’re never far away from that perfect cup of coffee or an indulgent ice cream sundae. 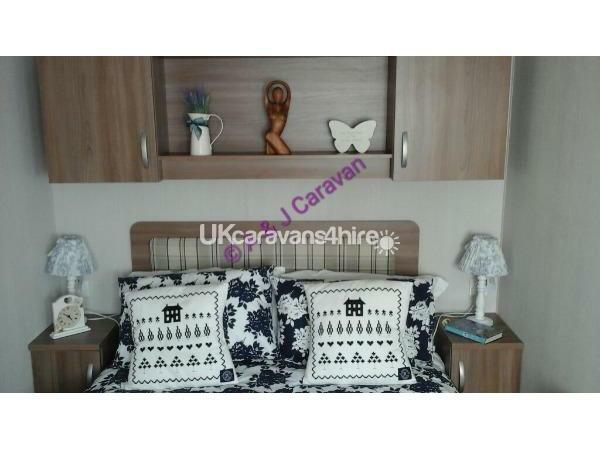 The caravan was beautifully presented with all mod cons, and the personal touches made it very homely. It was extremely clean and comfortable. The owners were very friendly and indeed had left flowers and a card to welcome us, which was much appreciated. 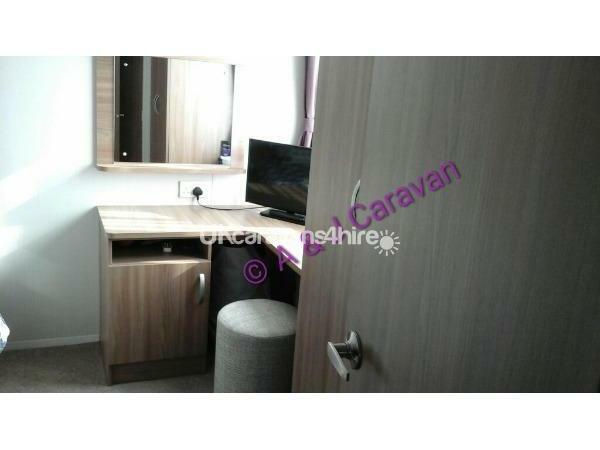 The caravan is situated on an ideal location on the park. I would highly recommend this caravan. Simply the best caravan we have ever hired. Beautifully presented, a card to welcome us. I was my daughter's birthday on the day we arrived, Avril left her a card and a cake, such a lovely touch, thank you. 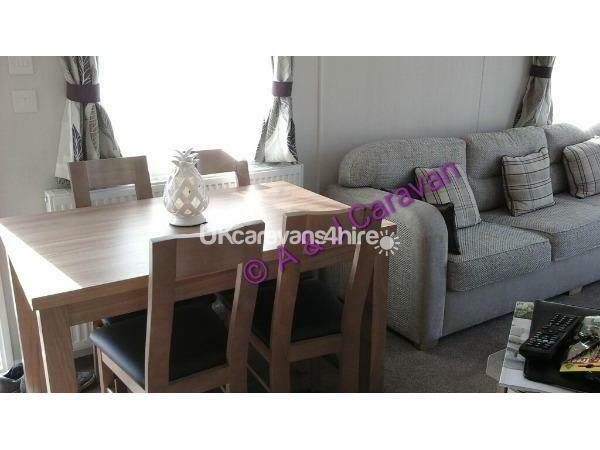 Caravan in ideal location, will be booking for next year!! Absolutely lovely caravan. It felt like a real home from home with all the little extras such as the DVD’s and board games. Avril and Jeff even left us birthday cards and some chocolates which was such a thoughtful and personal touch. The whole family truly enjoyed our stay and we would definitely recommend it. Thank you for your kind review. It was a pleasure renting out to you. It's so much appreciated that you left my caravan as you found it spotless. We are a family of six people with age ranges from 5yrs to 66yrs. 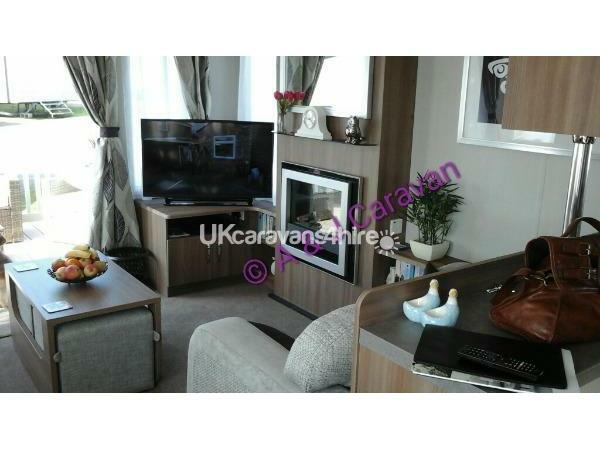 We have just returned from a very enjoyable few days in a exceptionally comfortable caravan. As my daughter said this lady as thought of everything, there was nothing missing as far as we could tell, anything we wanted was there. Contact with the owners was good, everything ran smoothly and we hope to return in the future. The flowers and card was a lovely touch, thank you Avril and Jeff. Just like to thank Avril and Jeff for another lovely holiday in their caravan.This is my friend and myself's second stay this year it is a fantastic caravan so clean and comfortable ,home from home did'nt want to leave.Once again thank you hope to see you next year. 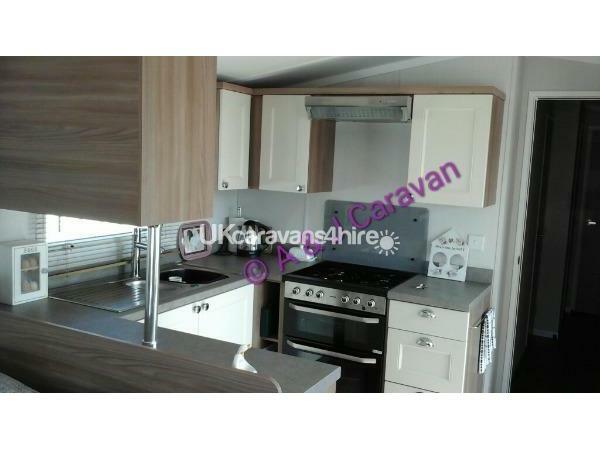 This is the cleanest, nicest caravan we have ever hired, and would recommend to anyone. The owners are very friendly and honest. Best caravan we have hired in some years,would not hesitate to book again,fantastic couple who own the caravan very friendly and left a bunch of flowers and a card on arrival. 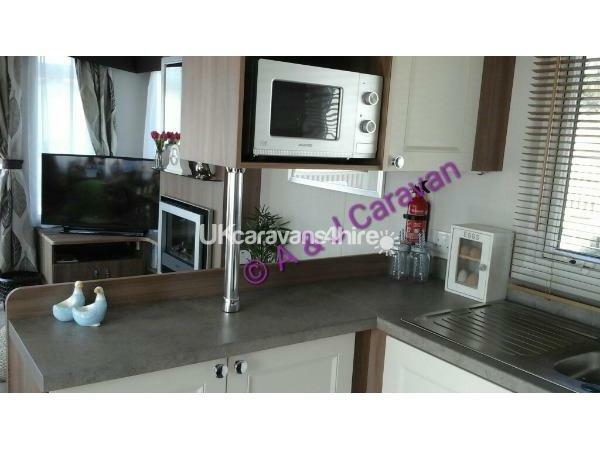 This caravan was excellent for our needs. Perfect location on the site. Spotlessly clean. Very well equipped with everything you should need for an enjoyable stay. We contacted the owners prior to our stay and each time , my email was dealt with and responded to immediately. Jeff also made some recommendations which were spot on. We have had such a good time here and will be booking again and passing the details onto our family and friends. 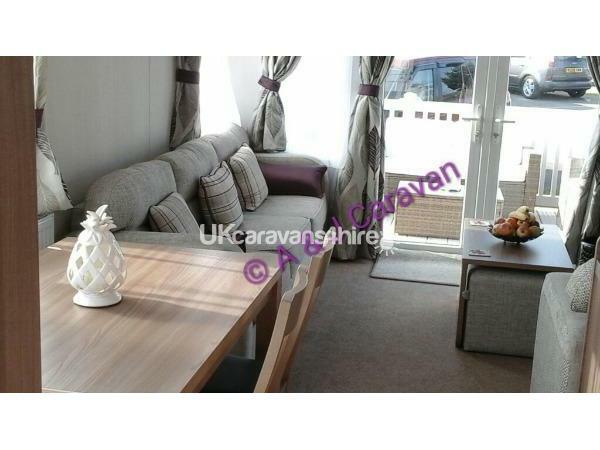 If you are considering this caravan than I can say you will not be disappointed so good ahead and book without delay. What a fantastic caravan to stay in, it was immaculately clean, full of useful things to enhance our stay and in a superb location on the park, near to the Lake View Restaurant, boating lake and fun fair (a great hit with the kids) but far enough away that we didn't have any noise. I would highly recommend this caravan. Myself, my husband and our three children had a great holiday, and would certainly book again.